Salty Seabirds are a group of swimmers that swim in the sea on Brighton and Hove's beaches all year round. We are not an official club, rather a community of like-minded swimmers. As of March 2019 we have over 500 members! We post in our Facebook Group where and when we are swimming for others to join us and there are usually early morning, daytime and evening swims. The locations change, as do the times, but are normally to the west of the West Pier. We even do day trips sometimes! Some of us skin-swim all year round and are great believers in cold water therapy. Others wear wet-suits. We don't really care what you wear as long as you get in the sea! We aren't concerned with times or distances. Depending on who joins us on the day will dictate whether it's a disciplined swim around the buoys or a leisurely social swim, parallel to the pebbles, counting the concrete groynes. You can chose your stroke. Some do front crawl, others breaststroke and a few back stroke. We are yet to spot a butterflying seabird. We understand that there are points in people's lives where they need support; to build resilience and make improvements to their well being. The Seabirds community provides company and respite from day to day challenges and worries. Even on days when it is too rough to go in we will meet and paddle, pilchard (lie in the shore dump) or walk. And there is always tea and sometimes even cake. We have no clubhouse so you need to be prepared to change on the beach! As an 'unofficial' club we have no rules......but we also have no Public Liability Insurance and participants swim at their own risk. We stick to lifeguarded beaches in the summer months and make safe choices in the colder rougher winter ones. 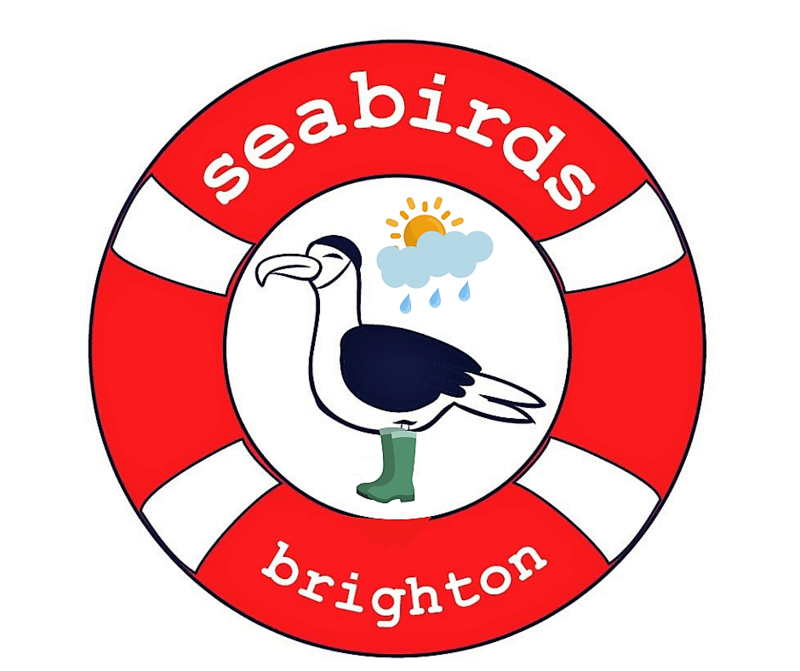 Salty Seabirds is the swimming group affiliated to Seabirds Ltd, our Social Enterprise that sells affordable and ethical swimming accessories, such as swim hats, changing robes, sports cloaks, plus eco-goods that offer alternatives to single-use plastics in our webshop. The profits are donated to local community groups and charities that focus on improving wellbeing using the beach and the sea as their base.